There’s not long now until Children’s Book Week takes place in Australia - August 20 - 26, 2017. You can find loads of ideas to help parents, teachers and librarians tease out the theme, Escape to Everywhere, in my article Ideas for Children’s Book Week 2017, and there are many prompts and suggestions to engage kids with books and learning in Activities for Kids - Children’s Book Week 2017. 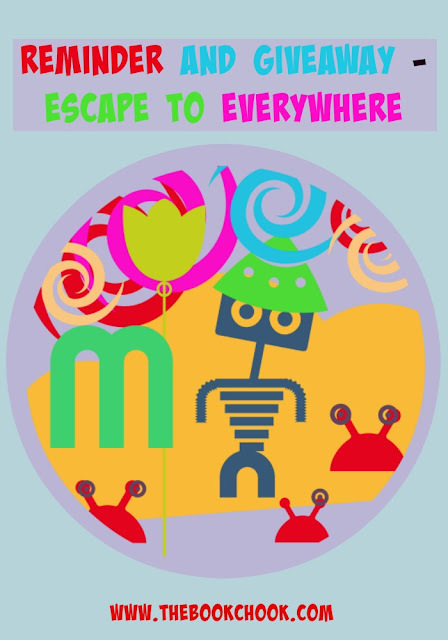 Giveaway: Escape to Everywhere - with an Escape Room Kit! To help with your Children’s Book Week 2017 planning, Lock Paper Scissors, Escape Room Kits are giving four readers of The Book Chook two free printable escape room kits, each. What a fun way to celebrate the Book Week theme - Escape to Everywhere! The first kit is Escape Quest. It’s designed for kids’ parties, ideally for children aged 8-10, and comes with over 80 printable puzzle cards. But it would also work at school or camp. The second kit on offer is The Lost Mummy. It’s designed for kids 10-12 years, and like the other kits is editable and customizable. I have to admit I am impressed with Lock Paper Scissors. There is so much generosity of spirit in evidence with this company. Basically, the business sells escape room kits, but marketing is aimed at people who don’t have time to start making an escape room kit from scratch. The website also offers a wealth of free advice and suggestions. For instance, here’s a great explanation of why and how to use escape rooms in the classroom. Here’s a list of 32 escape room puzzles that are reasonably inexpensive to create at home. And here’s an excellent detailed explanation of how to craft your first escape room. The kits themselves seem reasonably priced to me (e.g. the two mentioned above are $US 19.99 each) for people who simply don’t have time to do all the preparation involved in creating one. If you would like to be in the running to gain access to both Escape Quest and The Lost Mummy, you should send an email with Escape in the subject line to thebookchook (at) gmail (dot) com within the next three days. A random and possibly sleepy chicken will choose four lucky recipients at 5.00am on July 8 eastern Australian time, and I will notify those people soon after. Update: The giveaway is over, and the four recipients have been notified. Would you like two posts from The Book Chook delivered to your inbox or a reader each week? You'll find subscription methods at top of the left side column. If you’d prefer to access not only my posts, but extra educational content I share, check out The Book Chook page on Facebook, or follow @BookChook on Twitter.